This game was gorgeous. Initially conceived by Steven Spielberg, this game plays like a movie. 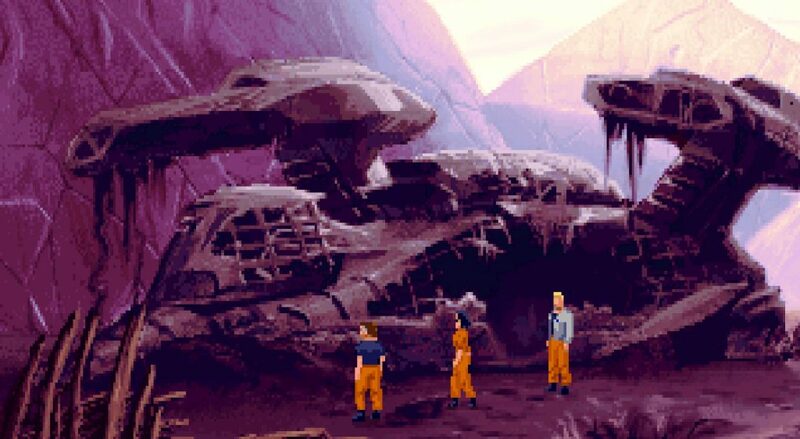 While the puzzles were quite a bit harder than the average LucasArts point-and-click adventure game, and the hilarity level was pretty dang low, the game was still overall very enjoyable. Hopefully you had a chance to play the game this past month, but even if you didn’t you’ll probably still get a kick out of our conversation about the game. Also, we welcome our good friend, Brent Peterson, onto the podcast and chat all about the gameplay of The Dig. We had a blast and hope he did too. Lastly, we bought the game on GOG.com. It’ currently $6, but goes on sale very few months. Also, give it a listen to find out what game we’re playing next month. Enjoy! We mentioned The Dig novel by Alan Dean Foster. Check it out here. Only 99¢! This entry was posted in Episodes and tagged Podcast, The Dig.